Solar warden is a Six-Degrees-of-Freedom space shooter combined with an overarching campaign with real time strategy elements – jump into your fighter and combat the Silicoid menace up close, while you command and dispatch the Solar Warden fleet for reinforcements as you see fit. You will gain the favour of nations you support, granting you funding, research, and military assets to further you in your goal. Experimental ships, weapon systems and upgrade tech will be at your disposal. But make no mistake, any damage Earth’s surface takes is persistent in your campaign. Failure to defend means loss of diplomatic ties, research, and ultimately, doom to the planet itself. However, this is no task you have to undertake alone: Solar Warden features full co-op support in all of its campaign, allowing you to fight for Earth’s survival together with up to 4 friends. 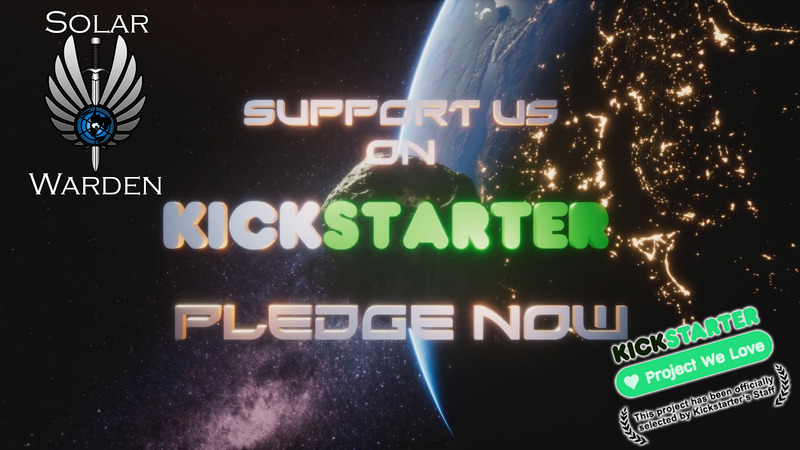 Solar Warden is LIVE as a featured Kickstarter! Solar Warden is now LIVE on Kickstarter! Pleadge now over on Kickstarter! Feeling your grip tighten on the throttle, you clench your teeth as you feel the rush of the afterburner kick in. Closing the distance at ludicrous speeds that could never be achieved in atmosphere. Your focus narrows on the target in front of you. The sounds of missile the lock screaming in your ear. You are reminded that if you fail, that blue marble just outside of your cockpit we all call home will no longer be there for you to return to. But you will not let that happen. Even if your deeds go unsung and unheard of, you are among the elite of the elite. Protector of Earth and guardian against the alien threats and commander of the Planetary Defense Initiative. You are… Solar Warden. We are a Space Shooter / Real-Time Strategy hybrid indie title from the developers of MechWarrior: Living Legends. We have also been featured on Kickstarter! But we still need your support to make Solar Warden a reality! Pledge your support today to help save the planet! Join us over on Kickstarter! The latest round of Epic Games Unreal Dev Grants program has announced its indie recipients. We are now in the final 48 hours of our campaign. Victory is within our grasp! Join the Fight! Pledge today! Nice, i cant wait for it to come out.